It is with profound sadness that we report the death of Dr Mel Richardson, a dear friend and colleague on 3rd January. 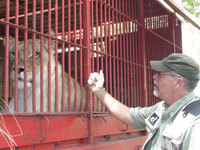 Known to many as simply “Dr Mel”, he was the overseeing veterinarian on several ADI rescues – including Operation Lion Ark – and also provided expert testimony for ADI for legal cases, hearings and in the US Congress. Dr Mel Richardson died of heart failure aged 63. Vastly experienced, with over 40 years working with captive wildlife, Mel had initially been employed by zoos and the captive wildlife industry before turning his back on that world and dedicating his life to saving and protecting animals. Mel was required to work in the field with minimum resources and sometimes extremely sick animals but we always knew that the animals were in the safest hands possible. He also had to treat a range of species. During Operation Lion Ark, in addition to 30 lions, there were horses, dogs, monkeys, a baboon and even a deer! He worked tirelessly, also training and guiding young veterinarians and veterinary students. Mel had suffered poor health over the past year. He was unable to make the US premiere of Lion Ark at the Mill Valley Film Festival, but he joined us when the film was screened at the Sun & Sand Mississippi Film Festival, where Lion Ark won Best Documentary. Tragically it was not to be. Special memorial screenings of Lion Ark are being organised later this year in Chico, California and Atlanta, Georgia, where Mel had lived. Funds raised will go towards the Peru rescue, which was so important to Mel. If you would like to to donate to the Peru rescue, you can do so here. We lost another great animal protector over Christmas with the death of Tony Moore, co-founder of Fight Against Animal Cruelty in Europe from lung cancer, aged 79. For over 25 years, Tony – together with his wife Vicki, who tragically died from injuries sustained whilst filming undercover in 2000 – campaigned against bullfights and fiestas. In 1996 ADI presented Tony and Vicki with the Lord Houghton Award for outstanding service to animal welfare. The animals have lost a dear friend.